My 8 month old is not crazy about solids. What can I say, she loves mama's milk! But now that I go to work away from home twice a week, my husband has to feed her something (she is not bottle friendly). So far we have tried Earth's Best, Plum Organics, and now Sprout Baby food. I can't compare the three since I think they are all great, but I really like that they all have different flavor combinations. Sprout Baby Food: Sprout Baby sent us the Roasted Banana and Brown Rice, Sweet Potatoes and White Beans, and Roasted Apple Blueberry baby food pouches. They have many other delicious flavor combinations. My daughter is totally in love with the Roasted Banana and Brown Rice! Quite possibly she likes it even more than mama's milk... I have the peace of mind that it is all organic, the pouches do not have BPA, and it saves me time as I don't have to make her food on the days I leave her with daddy. Great on the go as well! At first it seemed like the pouches are hard to get all the food out of, but once you figure it out, you can just open it wide and easily scoop out what you need. A 12 pack of the baby food costs $16.65. Sprout Online Shop: Sprout Baby was also generous enough to let us try the To-Go Ware 3-Tier Stainless Steel Tiffin Set. This nifty little set of containers is great for taking lunch or snacks with you. Reduce waste by reusing it over and over. It is really easy to wash and maintain and you don't need to worry about BPA. With the three containers you can pack a pretty generous lunch, not just for a child, even an adult. I like a combination of a rice dish, salad, and dessert. The Company: Sprout Baby is not just an online store. They are advocates for creating non-toxic environments for our children. While it is a lofty goal, what parent doesn't want a healthy child? "As we grow to include more options to fit more needs, we will provide comprehensive, Eco-conscious, e-commerce and social shopping which is centered around making it easy to make mindful decisions about the products parents choose to put on, in and around their children and families." They will also have an integrated social network on their site where like minded parents will be able to discuss the best products and methods for childcare. Not contain health compromising chemicals - including alkylphenols, polyurethane, petroleum distillates, phosphates, chlorine, chlorinated or brominated solvents, petroleum-derived or petrochemical fragrances, parabens, sulfur oxides, organohalides, formaldehyde, trichloroethylene (TCE), perchloroethylene (Perc), dioxins and furans, hexavalent chromium, organophosphate pesticides, polybrominated diphenyl ethers (PBDEs), di-(2-ethylhexyl)phthalate (DEHP), 2,4, dichlorophenoxyacetic acid (2,4, D), or triclosan. So there you have it! Every reason to give Sprout Baby a +5! I think I've found my favorite online baby shop. Yeah, I know some may think I am an irrational, overprotective mom. SPROUT BABY IS GIVING AWAY A $50 GIFT CARD TO THEIR STORE! 1. Go to the Sprout Baby website and tell us in a comment what product you like most. Contest ends at 11:59 p.m. EST on Tuesday, Oct. 20. The winner will be selected using Random.org on Wednesday, Oct. 21, and notified by email (so please be sure I have a way to get in touch with you). Thank you! also added you to my blogroll! The stainless steel bottles are cool! not sure if she will eat it but I might! I love the Petite Baby Bag. I like their Elements Naturals Baby Wipes and the Sweet Knee Petite Baby Bag. The petite baby bag is nice. Thanks for the chance. 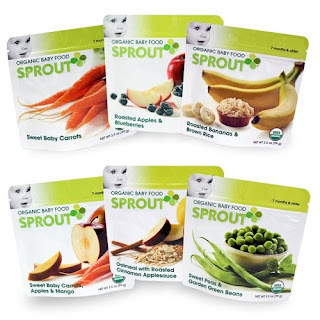 I would love to get the Sprout Foods Variety 12-Pack for Babies Six Months and Older. I like the sound of roasted bananas and brown rice best! The roasted bananas and mango sounds yummy. I follow EcoBabyz on twitter and I tweeted. I love the Thinksport Stainless Steel Bottles. We have one and it is awesome! I would love a couple more so we can all have one. roasted bananas and mango sounds yummy enough for me to eat! mmmm! I follow Sprout Baby on twitter at http://twitter.com/cakeblast. I truly love the smiling planet plate with the whale!! .., i just find your blog colorful and healthy.. so i popped up.. :) keep on going.. Question - Information was posted that the Sprout baby food didn't contain Furans. The FDA indicates that Furan enters foods, such as baby foods, via the heating process of the foods. Is Sprout indicating that they simply do not "add" furan derivatives or do they guarantee that furans are not in the food after being processed and packaged?